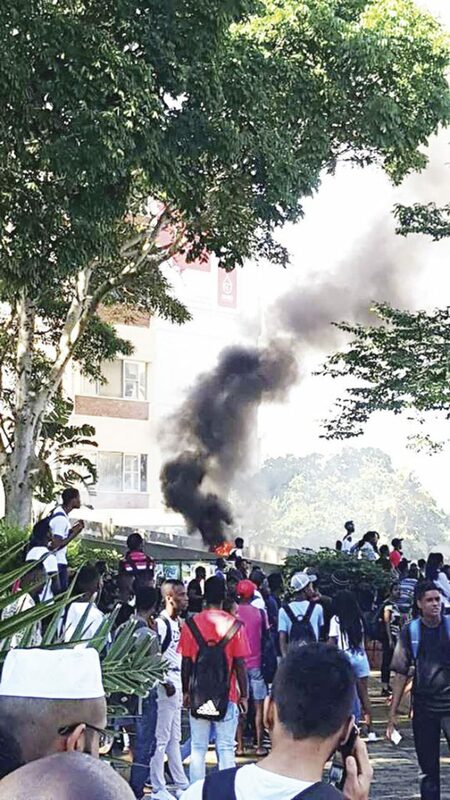 As the academic programme was set to commence at four of the University of KwaZulu-Natal (UKZN) campuses on Wednesday, incensed protesters resurged and set fire to a building at the Westville campus on Wednesday morning, sending students scurrying in all directions. According to reports, UKZN Westville Student Representative Council (SRC) president, Sanele Hlongwa, confirmed that there was protest at the Westville campus and added that the SRC had met with university management on Tuesday. Hlongwa is reported to have stated that an agreement had been reached whereby students would not embark on any protest action at any of the campuses pending the finalisation of meetings to address their grievances. Social media was abuzz with alerts warning students to steer clear of the campus and parents to ensure the safety of their children. The resumption of classes was announced after a statement was issued on Tuesday following discussions between university management and the SRC. The statement was vague about whether the tabled issues have been resolved however, the Executive Management appealed to members of the academic staff to have all tests and assignments postponed to the week of 18 March 2019. On Monday, a shared communique posted on the UKZN Facebook page, signed off by the Vice-Chancellor and Acting Principal, Professor Nana Poku, stated that ‘due to extremely violent student protests, the executive management (EMC) took a decision to suspend the academic programme at the Edgewood and Westville campuses on 7 March 2019 and at the Howard College and Pietermaritzburg campuses on 8 March 2019. The suspensions of the academic programme at all four campuses will continue until further notice. According to the demands of the SRC, they required the poor security at the different campuses to be addressed, funding for post-graduate studies and students’ request for Wi-Fi at their residences. Regarding the successful conclusion of the semester, management stated that UKZN would initiate a catch-up campaign to ensure that the semester was completed. Seminars and plays at the Elizabeth Sneddon Theatre is reported to continue as planned.